Bitters are an aromatic flavoring agent made from infusing roots, barks, fruit peels, seeds, spices, herbs, flowers and other botanicals in a high proof alcohol. Bitter herbs, barks and botanical tinctures have been made for centuries dating back to the 1600’s and have been reputed for possessing medicinal properties. Before bitters were added in dashes to cocktails they were being drunk in larger amounts as a patent medicine. Bitters were used as a cure for many different ailments from headaches to stomach cramps. Bitters can still be used as an herbal medicine! When I have a stomach ache I will add four to six hefty dashes of bitters to soda water and it certainly has restorative powers. Colonial America started to embrace bitters more as a flavoring agent than a medicine. A federalist newspaper dating from May 13, 1806 referring to a drink served at a political rally wrote, “Cocktail is a stimulating liquor composed of spirits of any kind, sugar, water and bitters- it is vulgarly called a bittered sling and is supposed to be an excellent electioneering potion, inasmuch as it renders the heart stout and bold, at the same time that it fuddles the head.” Bitters started to gain real popularity once the cocktail was embraced. Hundreds of different brands of bitters where in use up to Prohibition. But by 2004 only three commercial brands of bitters were still standing. This could be because of the misconception that bitters will make your cocktail bitter. Although this is understandable, it is not true. Bitters are more the seasoning agent to a cocktail. They are frequently referred to as a bartender’s salt and pepper. Bitters are a great way to add complexity or balance out the sweetness in a drink. They can add aromatic spiciness, help cut through richness and unite dissimilar ingredients. With the craft cocktail movement in full swing, bitters are booming and we are seeing a resurgence of artisanal and craft bitters. With so many bitters to choose from, how do you know which ones to have in your home bar? These are the most popular and widely recognizable bitters by it’s yellow cap and oversized label. Angostura bitters were made by a German doctor named Johann Gottlieb Benjamin Siegert. In 1820 he left for Venezuela and was appointed the surgeon general based out of the town of Angostura. It was here that he harvested local roots, herbs, botanicals and barks. However, despite the name, he did not use the bark of the angostura tree. His bitters gained popularity by seasick sailors and where soon available all over the world. Thirty years later the doctor retired from medicine to focus on his bitters business. 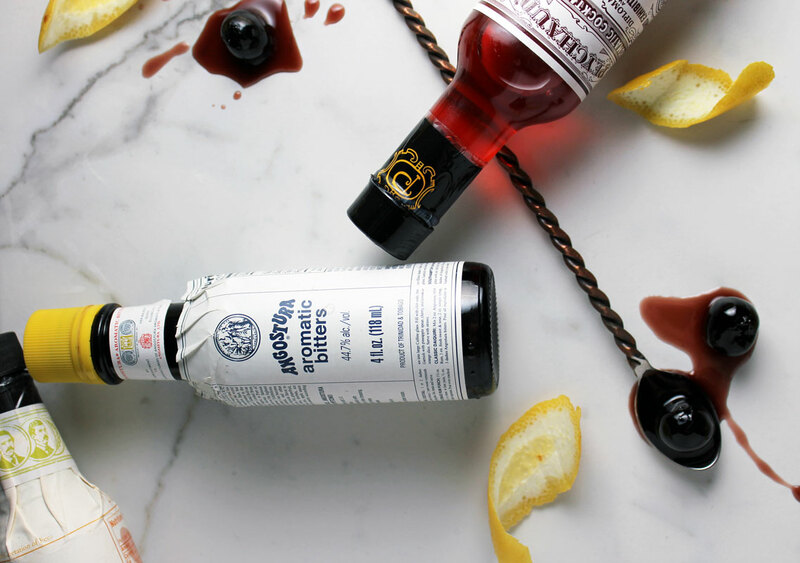 These bitters have stood the test of time and are an integral part of many classic cocktails such as the Old Fashioned, the Manhattan and the Champagne Cocktail. The original formula remains a company secret and is known only to five people. 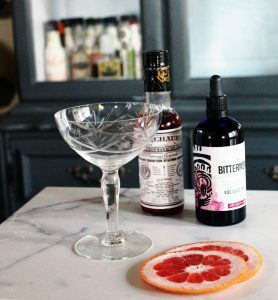 These bitters have become synonymous with the classic New Orleans cocktail, the Sazerac, as well as many other New Orleans staples. Peychaud bitters aren’t as seasoned at Angostura but have a more floral, light cherry flavor and anise spice to it. Next to aromatic bitters, orange bitters have the longest historical pedigree and are the most versatile. The flavor of orange bitters is more straightforward than Angostura and Peychaud’s. You get notes of fresh orange peel, a slight sweetness, and a spice profile of cardamom and coriander. There are several different brands offering orange bitters and all have a slight variation to them. At least that’s what we are telling ourselves to justify having four different bottles of orange bitters in our home bar. These three bitters will get you far when making cocktails at home. Anything beyond this isn’t terribly necessary, but if you are like us, you are always looking to grow your collection. We love these! 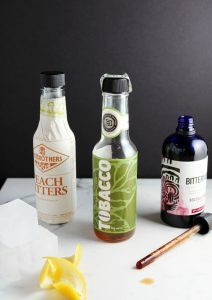 These bitters add a nice smokey overtone, a little bit of spice, and really pack a punch. They are great in a Manhattan. These have notes of chocolate, cinnamon and spice and really add a nice complex and hard to pinpoint dimension to a drink. 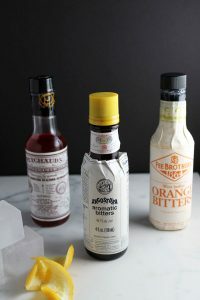 If you really want to go above and beyond you can make your own bitters with any crazy combination you can think of. We’ll be touching more on that subject soon!